This database project is conducted in collaboration with the University of South Florida's Alliance for Integrated Spatial Technologies (AIST) and the Foundation for the Advancement of Mesoamerican Studies, Inc. (FAMSI). The continuing effort makes extremely high definition, three-dimensional laser scans and the visualization of scan data of Mesoamerican objects available to researchers. The data is offered in a variety of formats to assist iconographers, epigraphers, educators, and interested observers. New data sets and images will be made accessible as they become available. The visual and plastic arts of Mesoamerica are exceptional traditions that have captured the attention of generations of researchers: archaeologists, epigraphers, iconographers, and art historians. The quality, beauty, and magnificence of the artisans' work have also caught the imagination of travelers and admirers of art from the novice to the connoisseur. The Mesoamerican Three-Dimensional Imaging Project brings these artifacts to viewers and researchers in a new, stimulating, and interactive way. The images in the database are a way to see Mesoamerican objects the way the original artist intended, in three-dimensions. Screen captures and other formats of scan data and documentation are made available through a variety of digital media documentations, and three-dimensional data sets can be made available for researchers. Images are presented at a level of detail that has not been previously possible. For the scholar or researcher, the database allows intimate inspection and analysis. Using three-dimensional data sets can allow artifacts to be examined on the office, lab, or home computer as thoroughly and meticulously as if the object were physically present. With a free, downloadable viewer, complete data sets are viewable in three-dimensions, the images can be manipulated a full 360°, enlarged for closer scrutiny, the light source can be repositioned to any angle to bring out or enhance desired detail, and extremely accurate on-screen measurements (±.005 mm) can be made anywhere on the object. This data base allows people anywhere in the world to conduct visual analysis and investigation without having to visit the actual artifact. The Mesoamerican Three-Dimensional Imaging Project establishes an expandable database of Mesoamerican artifacts. 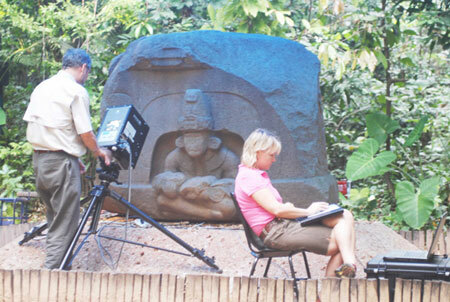 The initial purpose is to record and document a wide variety of sculpted objects through the best available technology. By placing these image sets in an archival format that will preserve the data for the foreseeable future, it also makes these artifacts easily accessible to researchers and interested individuals. Through a fusion of state-of-the-art systems of three-dimensional laser scanning, digitizing, and processing, accurate renderings of these objects are offered for a diversity of applications (Doering and Collins 2008). The ability to document the sculptural record with ultra-precision, in effect, "freezes" the piece in its present condition. Any future deterioration or degradation of the piece through natural or anthropogenic processes will not affect the documented record of the object. Also, accurate imaging of Mesoamerican iconography and epigraphy is crucial to the decipherment of the information carved on stone, wood, ceramic, shell, or stucco. Documentation of sculpted artifacts and monuments from Mesoamerica is also of great importance for cultural heritage, interpretation, and preservation issues. Accurate, interactive, high definition three-dimensional images of the actual objects provide the researcher a number of advantages over more conventional recording processes. The individual viewer can literally "see" the artifact through their own eyes, ask their own questions, and make their own interpretations. They are no longer dependent upon the subjective observations or limited perspectives inherent in other two-dimensional forms of documentation. Processed scan data sets can be used to generate an exceptional archival record for research, restoration, reconstruction, replication, and monitoring of deterioration, using the best available technologies (Collins and Doering 2006; Price 1996: 30; United Nations 2005). 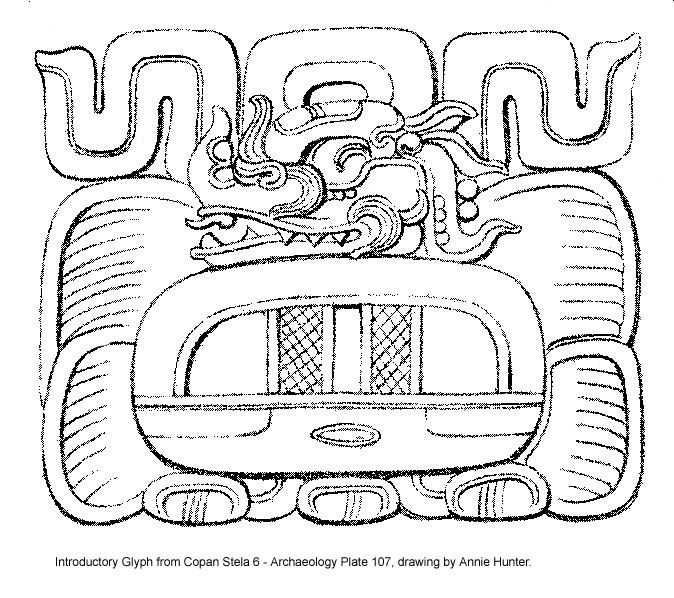 The objectives of the Mesoamerican Three-Dimensional Imaging Project are manifold. Various obstacles have hindered a systematic, coordinated, and broad-based study of Mesoamerican artifacts, primarily stone sculpture. Impediments to these types of comparative examinations have been due to the fact that many objects are disunited, dispersed across international collections and storage facilities. Additionally, sculpted pieces that have been documented may not contain detail or visibility sufficient for critical iconographic and epigraphic analysis, and Kaplan (1995:1) has called attention to difficulties in accessing some collected data. Thus, the availability of images adequate for comprehensive study is restricted for a majority of potential researchers. The Imaging Database hopes to remove, or at least alleviate, some of these barriers. The database is readily expandable and new objects and images will be periodically added. Because the data is in an electronic format, newly scanned materials can be regularly inserted into the corpus. The electronic format also allows standardized file types to be incorporated; thereby, multiple contributors can donate scan data or visualizations and images to the database. The method of storage and format design allows these data to be used, augmented, and updated as new and improved technologies are developed.  Smaller, sample datasets are available for full three-dimensional viewing and analysis. These samples will allow the viewer to experience the analytical and visual capabilities of complete data sets for each object.  To view the full three-dimensional data sets available directly from this web site, the Geomagic Review© free inspection software must be downloaded to the viewer's computer (http://www.geomagic.com/en/products/qualify/review/index.php). The downloading and use of this program is free, and it provides much the same access and work functions for three-dimensional data as Adobe Reader© does for PDF documents.  The full data sets for each object in this database are available for research. In order to request complete data sets, please send an email to . When the request is received a questionnaire and use agreement form will be forwarded for completion. Upon acceptance by all parties, directions for data retrieval will be provided.  The static "screen-grab" scan images provided for each objects are two-dimensional representations of the actual scan data, and are not representative of the actual three-dimensional data sets which can only be observed and examined with a proper viewing or inspection software such as Geomagic Review©. We invite your comments, suggestions, and questions. Please let us know how we can improve this database. We also welcome additional or corrected information. Any individuals or institutions collecting similar three-dimensional scan data are welcome to contribute to the database. For further information and details, please contact us. Thank you. Travis Doering, Ph. D. or Lori Collins, Ph.D. The materials contained in this archive are available to interested parties for scholarly study. For publication or other use of original drawings, photos, or scans permission must be requested in writing from the authors. For further copyright information, please go to http://www.famsi.org/research/copyright.htm.